7th Pay Commission : Benefits of Bunching of stages in the Revised Pay Structure under CCS(Revised Pay) Rules, 2016 *** OFFICE OF THE PRINCIPAL CONTROLLER OFACCOUNTS (FYS) ...AN-PAY….Section, 10-A, S.K. 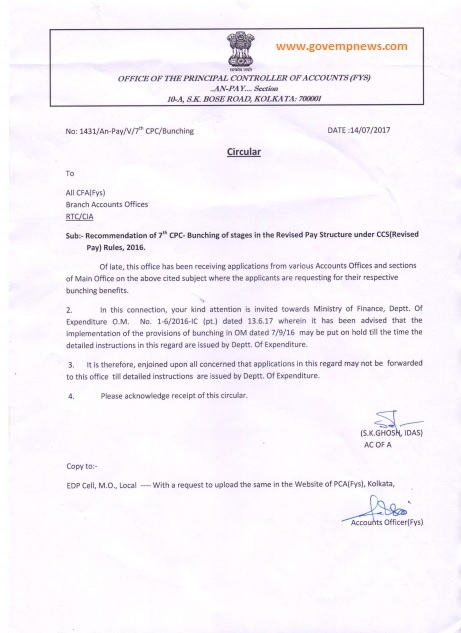 BOSE ROAD, K OLKA TA: 700001 ** No: 1431/An-Pay/V/7th CPC/Bunching DATE :14/07/2017 ** Circular ** To, All CFA(Fys), Branch Accounts Offices, RTC/CIA ** Sub:- Recommendation of 7th CPC- Bunching of stages in the Revised Pay Structure under CCS(Revised Pay) Rules, 2016. ** Implementation of the provisions of bunching in OM dated 7/9/16 may be put on hold till the time the detailed instructions in this regard are issued by Deptt. Of Expenditure. Sub:- Recommendation of 7th CPC- Bunching of stages in the Revised Pay Structure under CCS(Revised Pay) Rules, 2016. Of late, this office has been receiving applications from various Accounts Offices and sections of Main Office on the above cited subject where the applicants are requesting for their respective bunching benefits. 2. In this connection, your kind attention is invited towards Ministry of Finance, Deptt. Of Expenditure O.M. No. 1-6/2016-IC (pt.) dated 13.6.17 wherein it has been advised that the implementation of the provisions of bunching in OM dated 7/9/16 may be put on hold till the time the detailed instructions in this regard are issued by Deptt. Of Expenditure. 3. It is therefore, enjoined upon all concerned that applications in this regard may not be forwarded to this office till detailed instructions are issued by Deptt. Of Expenditure. 4. Please acknowledge receipt of this circular.